I found the associated polling report at PolitickerNJ.com along with the relevant description excerpted below. I've admitted the likely voter result into our database, as outlined within our methodology. Republican Christopher Christie leads Gov. Jon Corzine 39%-36% among definite voters, according to a poll conducted by Neighborhood Research, a survey firm run by conservative strategist Rick Shaftan. Independent Christopher Daggett is at 6%. 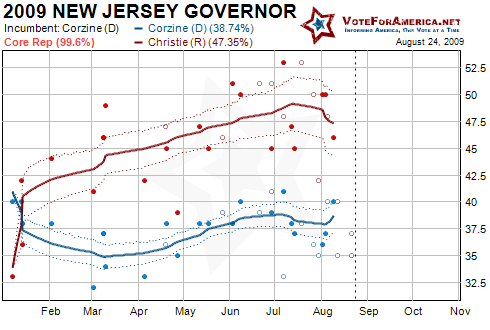 "If Corzine gets his liberal/urban/Democratic base together he's going to open up a significant lead, forcing Christie to work the right," Shaftan wrote in his analysis. The poll was conducted between August 12-21 with a sample size of 319 and a margin of error of +/- 5.49%. The party breakout among respondents was 43% Democrat, 34% Republican, 23% unaffiliated. There are some concerns about the sample size and the error that raise questions about the accuracy of this poll. For example, I highly doubt Christie has an approval rating of 20 favorable and 27 unfavorable; a very high rejection rate of over 50%. The most recent Quinnipiac University poll of New Jersey gave Christie a favorability of 42 and an unfavorable result of 26; a more reasonable rejection ratio of about 30%. The results of this Neighborhood Research (R) poll may in fact be accurate, but the noted anomalies are too numerous to warrant serious consideration. If this poll were to be included into our projection, both candidates would converge around 38% with a very slight advantage to Christie. Virginia remained unchanged, polling wise. More in a week. NJ Assoc of State Colleges & Univ. Copyright (c) 2008 VoteForAmerica.net. All Rights Reserved.